Are you ready for the Autumn breeze? Like an artist, nature started to paint the surroundings with the yellow and orange hue. The array of trees with yellow leaves on my way to home brings out the aesthetic of autumn which rejuvenates the energy in me after a long day. I see kids playing in their yard and making use of the last bit of day light before dusk comes with its relentless cold arms. Scare crows and Halloween decorations are popping up in the front yards of almost all houses. Markets are filled with all size and shapes of melons, squash and gourds. Yes, fall is officially here. I wish the days were longer and the sun shined brighter!! Its the season of apple picking and if you have tons of apple picked and don't know how to use it, here is a way you can devour the apples. I started making the apple sauce when my kids started to bring the packed apples home untouched. Kids like variety in their food, so we cannot blame them even if its easy for us to throw an apple in their lunch box. My kids absolutely love the chunky version of apple sauce which is seasoned with cinnamon. The aroma that fills in the house while making the apple sauce is really pleasant and you really wish it stays like that forever instead of spending money on air refreshers. If you had done some heavy cooking with spices, try making the cinnamon flavored apple sauce after that, which will neutralize the spiced smell that lingers in the house. This is a simple recipe and your kids are going to thank you for making this. If you don't have kids, make it for yourself, I am sure you are going to thank me for it :). They tastes perfect while they are warm. Take a heavy bottom sauce pan. Add apples and brown sugar to the pan. Cover and cook on low heat for 15 minutes. The apple starts to cook in the steam and starts to get mushy. Mix well and set the timer for another 10 minutes and cook on low heat. Use a potato masher to carefully mash the soft apple, leaving some chunks. Cover and cook on low heat for another 10 minutes. Add Cinnamon powder and mix well and cook for 2 minutes. 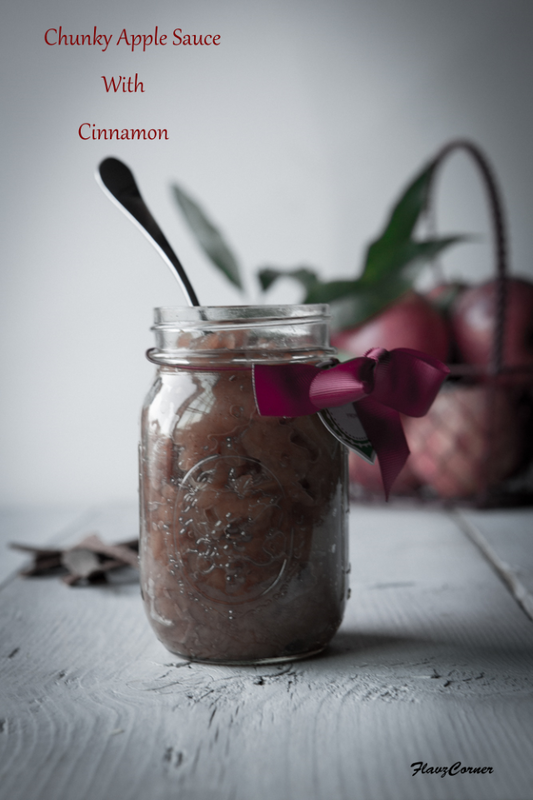 Enjoy the warm cinnamon flavored chunky applesauce after it cools down a bit or you can transfer the sauce to a clean/sterilized jar and refrigerate for later use. 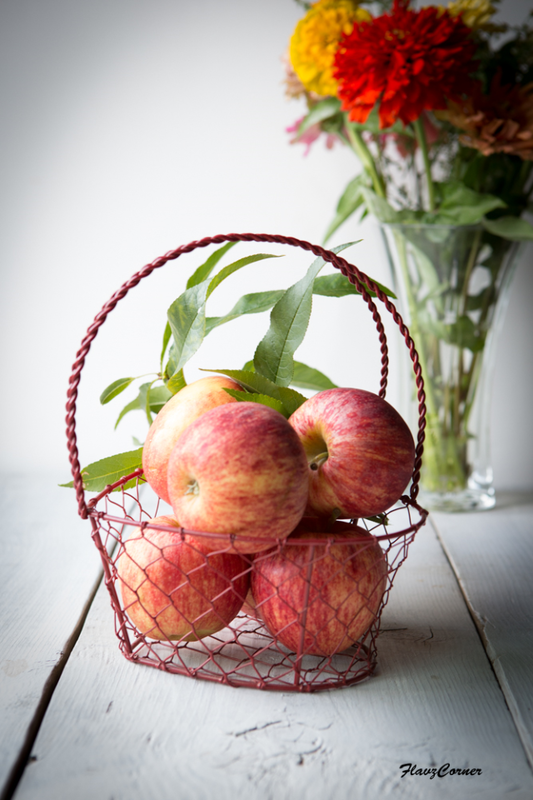 Adjust the amount of sugar if you are using tart apples. 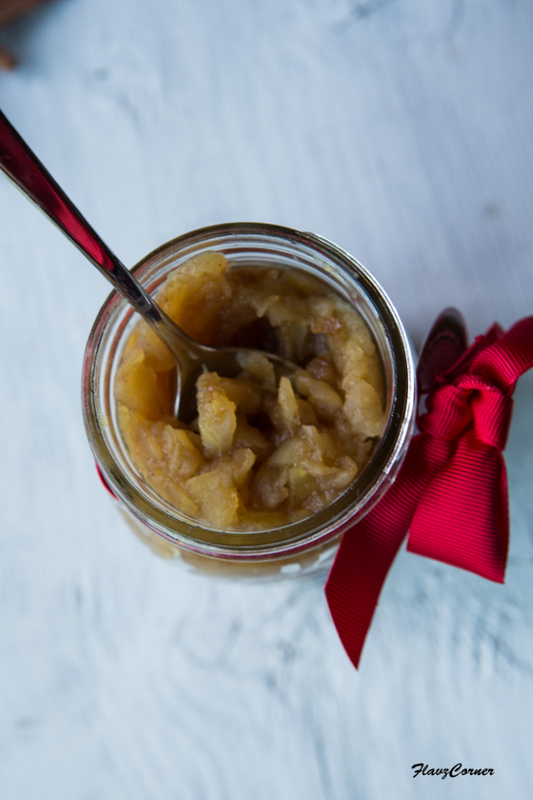 Warm apple sauce brings out the flavors better when compared to the cold sauce. So even if you have refrigerated the sauce, just warm it for 10-15 seconds in the microwave before having it. You can keep it refrigerated for one week. I usually make a batch and pack it as a dessert in the snapware containers for kids lunch. I love both chunky or smooth applesauce. And homemade is the best! Thanks for sharing,Shibi. Absolutely true Angie!!! Homemade is the best!!! nice sauce and fantastic clicks.. Thanks Rafeeda for the sweet comment!! You can enjoy the sauce as itself. You can use it in a variety of items like pan cakes, pie, tarts, cakes, waffles, cobblers etc. Thanks Jayanthi for stopping by!! Beautiful pictures too especially that first shot.